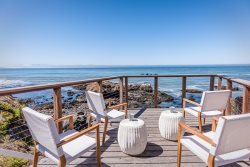 Marketing and Advertising – Website advertising on beachsiderentals.com, visitslo.com, discoveryroute.com, Airbnb (optional). We also provide rental brochures for all walk-in customers and have one posted outside our office. After Hour Phone Service - Beachside Rentals, Inc. staff is personally available 24/7 for any rental related emergency (no call service). All of us reside within 5 minutes of Morro Bay and Cayucos. We are responsive to complaints, problems or damages always. Housekeeping - Beachside Rentals, Inc. core cleaning team has worked with us for 8 years. In addition, we retain our supplemental seasonal cleaners for summer months and holidays. We assign an individual cleaner to each property which helps us maintain the integrity of your property. We are notified upon every tenant departure if anything needs additional cleaning, repair or maintenance, and if any item has been damaged. Inspections- Beachside Rentals, Inc. hires an inspector in the peak season to monitor tenant damages, cleaning consistency and overall inspection of the property. CSA Damage Insurance Policy- 98% of our guest purchase a CSA damage protection insurance policy that covers up to $3,000 of accidental damages to your home. Though not used often this policy has been helpful with past claims. Statements and Accounting - Beachside Rentals, Inc. sends monthly statements via email or mail. Our bookkeeper can pay any or all property bills if desired. In Person Experience- Not only do we communicate with every guest over the phone we also see most tenants at check-in. Beachside Rentals, Inc. is unique in the way that we interact with our guests and we take the time to meet them personally at check-in and aide them with any travel needs or questions.